What are the benefits of top dressing? Every spring topsoil companies are busy dumping piles of soil onto driveways and front lawns. From there the soil is moved to fill gardens, flower beds and used as a top-dressing for the lawn. I’m often asked about the benefits of top-dressing and just how to do it. I should start by explaining that a top-dressing is a thin layer of organic material (such as peat moss or composted manure), which is often mixed with sand or topsoil and applied across the top of the lawn. Top-dressing a lawn has a number of beneficial effects. Promote the development of soil micro-flora and micro-fauna, which are needed to break down thatch and grass clippings. Top-dressing works by changing the average particle size in the mixture of stuff that we call “soil”. The larger, more irregular the particles in your soil, the more airspace there is between them. It also works by “feeding” soil-dwelling worms and microbes, which break down the organic matter in the top-dressing and release nutrients to the soil. Finally, it works by allowing the soil to hold moisture better during dry conditions and letting excess moisture drain away when rainfall is heavy. There is no “best” top-dressing material for your lawn. Some people use mushroom compost, some people use peat moss, some use composted cow manure, some use their own compost. Depending on what kind of soil you already have, you may want to mix it with bagged topsoil or sand. If you have clay soil you may want to mix in a small amount of sand to help break up the clay. Most soil companies will offer a 4-way mix, which will include black earth, manure, peat moss, and sand. How often should it be done? You can top-dress your lawn every year without causing problems but most people will only top-dress once every few years mainly because it’s a fair amount of work. The lawn can be top-dressed in either spring or fall, but the spring is certainly more popular because you will notice the results that same growing season. Benefits are improved if you precede the top-dressing with core aeration and then over-seed the lawn with a good quality grass seed. Generally speaking, a layer spread to a depth of 3/8″ is just right. After applying the top-dressing rake it back and forth so that the existing lawn pokes up through the soil. 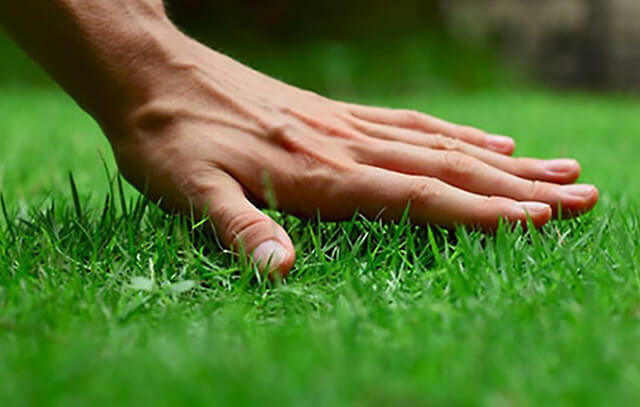 If the top-dressing is too thick, you risk smothering some of the grass and waiting longer for it to grow back. If it’s too thin, you wont get as many of the benefits and you may have to do it more often. How do I fix dog spots on my grass? How do I save my lawn in a drought? Is my lawn damage the result of insects?